Does Amazon.com's stock (AMZN - Get Report) belong in your... retirement account? It seems like an absurd question, right? After all, the stock is historically volatile, the valuation is insanely high, it doesn't show much in the way of profits and Amazon doesn't pay a dividend. So why then is it being discussed as a holding in retirement portfolios? Simply put: growth that could now be had at a much cheaper price. It makes sense to have Action Alerts Plus holding Apple Inc. (AAPL - Get Report) in your portfolio. It's got a low valuation, tons of profit, solid growth and returns a massive amount of capital to shareholders. We can also justify Cisco Systems, Inc. (CSCO - Get Report) , which has a low valuation, good growth and a sizable 3.2% dividend yield. Sensing a theme here? These stocks are basically the complete opposite of Amazon in that they don't have the company's future growth potential. It's unconventional to think of Amazon as a retirement stock, yes. But the potential risk of missing out on its future gains may be too large. Five years ago, Action Alerts Plus holding Amazon looked to be just an e-commerce player with good revenue growth, but no profits and super low margins. Then the e-commerce trend exploded. Retailers continue to file for bankruptcy left and right and those left standing have a whole new beast to battle: Amazon's internet. TheStreet's Executive Editor Brian Sozzi thinks retailers such as Walmart (WMT - Get Report) and Target (TGT - Get Report) are freaking out because of Amazon. As if the trends in online traffic aren't enough to make Amazon's stock a top pick, the company has quickly become a leading cloud services company with its Amazon Web Services division. This juggernaut business has accelerated Amazon's top line while also helping to pad its bottom line. The business' profits also help fuel the company's ambitious goals of dominating seemingly everything that it touches. An added bonus here: Amazon's Whole Foods business and its future potential under Jeff Bezos & Co. If you had bought Amazon's stock 15 years ago, you'd likely be in retirement by now. For all those that didn't though, it's not necessarily too late. While it's true that Amazon's stock is highly valued and quite volatile, carving out a tiny spot for the name in some investors' retirement portfolios can make sense. Even more so for investors who have a few decades before leaving the workforce. We're looking at you, millennials. An argument can be made for Amazon because a portfolio needs longevity; it's not all about safety. If that were the case, we'd all own bonds and have no equity exposure. But because we're living longer and life is costing more, we need our portfolio to generate capital gains in addition to paying out income. Juicing those gains is exactly what Amazon can do. 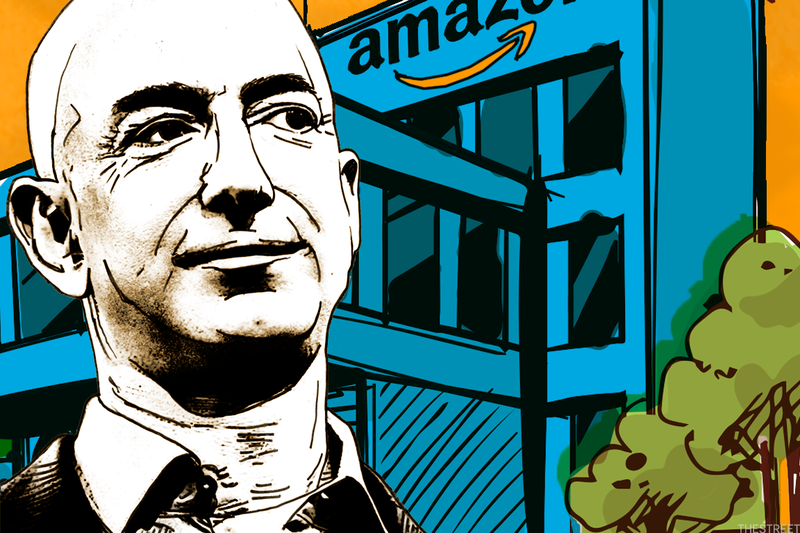 Now more than $200 per share off its highs and trading near $1,400, is Amazon stock a good fit? For certain retirement planners, it is. The company will be relevant in the next five years, 10 years and many more years. It's not adopting to the future like other large companies -- it is the future. In that regard, investing in Amazon today could pay out big dividends down the road. Watch BlackBerry (BB - Get Report) CEO John Chen share his thoughts on the tech stock rout with TheStreet's Sozzi.